Gene Sharp advises governments and resistance movements around the world and is considered the most influential living promoter of nonviolent resistance to autocratic governments. He is a professor emeritus of political science at the University of Massachusetts Dartmouth, and the founder of the Albert Einstein Institution, a nonprofit organization dedicated to advancing the study of nonviolent action. 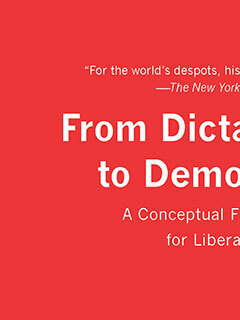 Sharp is the author of From Dictatorship to Democracy: A Conceptual Framework for Liberation (The New Press). He lives in East Boston, Massachusetts.